I recommend that you do NOT install these ISOs. In fact, over the course of the week I will describe how to avoid the Creators Update, at least until it’s ready for prime time. Because no matter how you slice it, Creators Update isn’t ready for any PC that you rely on. The ISO files will be posted on the MSDN site, for paying customers to download. At about the same time we’ll get some sort of official acknowledgment that this is the “real” Creators Update, along with general availability of the ISOs. It’ll be interesting to see how Microsoft words that announcement, having spent more than a week dodging questions as to whether build 15063 is in fact RTM. 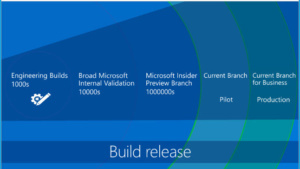 This cannon fodder phase, officially designated “Pilot” in this slide from a presentation by Microsoft Product Manager Nic Fillingham, spans the time from general availability until the version is anointed with the Current Branch for Business designation. That typically takes four months, during which time those who install the latest version of Windows 10 are, by hook or by crook, part of the pilot program.